Additions to Classic-Shock are made possible thanks to my first home CrazeArcade! A new member has been added to the Classic-Shock team, DreamstationX! So far his portfolio is small but he's kicked things off with a bang! He brings to you the first and only insert for Jockey Grand Prix! Go check it out in the Others section! -Added new "OJI-REN" link on the menu. OJI (Obscure Japanese Inserts)-REN(who knows what this stands for) is something I did a while back for those of you with some of those whacky japanese MVS titles. 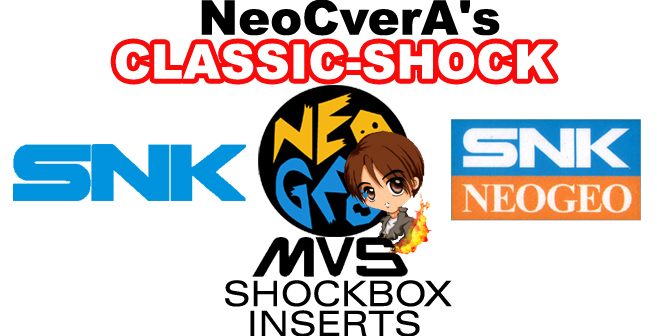 I basically used some AES insert scans and fit them into the shockbox template. Well the section is back and I added an all new addition: Neo Bomberman! This one I actually did a few things with so check out the new section and grab what you need. All of the Oji-Ren are hosted at CrazeArcade so special thanks to them for the hosting! SNK, Neo Geo, and all other trademarks are copyright SNK Playmore.